The operators of proposed satellite mega-constellations can greatly mitigate the risk of future collisions by rapidly de-orbiting their spacecraft at the end of service. On the other hand, doing only the bare minimum required by international "clean space" guidelines could significantly endanger the environment. This is the take-home from a new study led from Southampton University, UK. It urges operators to dispose of old satellites within five years. At the moment, best practice just calls for redundant hardware to come out of the sky within 25 years. There is increasing concern about the growth in space debris, or junk. Sixty years of orbital activity have littered the sky with millions of objects, ranging in size from flecks of paint to old rocket stages. These now pose a threat to current and future missions, particularly as the skies are set to get even busier. A number of companies, including OneWeb, Boeing, SpaceX and Samsung, are developing projects to launch thousands of satellites to deliver broadband and other telecoms services across the entire globe. New high-volume spacecraft manufacturing techniques and lower rocket prices are set to transform this business sector. Operators are expected to start deploying their constellations from next year, to altitudes just above 1,000km. In their modelling study, Southampton's Dr Hugh Lewis and colleagues put a "synthetic", or representative, 1,000-satellite constellation into the current orbital climate, and then simulated the possible outcomes over the next 200 years. The study showed that even with high compliance to current "rules", the number of catastrophic collisions over the period could increase by about 50% if old practices are maintained. Dr Lewis told BBC News: "What we found was that when you put the constellation satellites on to a disposal orbit, they intersect with objects below them. And if they take 25 years to pass through those lower altitudes, there is a good chance that they will have collisions with objects in the background population on the way down. But by reducing the 25 years to five years, you greatly minimise the chances of those interactions taking place." The likes of OneWeb has promised robust end-of-life clean-up of its spacecraft, adhering to the five-year suggestion, and aiming for no more than two years. OneWeb goes further by wanting to incorporate more fuel in its satellites for manoeuvring, and a grapple fixture on all platforms to enable forced removal by a servicing vehicle if normal de-orbiting were to fail for some reason. Airbus Defence and Space, which is making the spacecraft for the OneWeb constellation, was part of the Southampton-led study. Dr Lewis pointed to additional factors that would benefit the environment. These included making spacecraft smaller and lighter so that if they are involved in an impact, it will be a lower energy event that produces fewer fragments. Another key factor would be to ensure high reliability in the spacecraft by designing in multiple redundant systems. The best outcome calls for at least 95% of satellites to execute their disposal successfully. This will not happen if the satellites are prone to fail in orbit. "If we have a 95% success rate in post-mission disposal, and the lifetimes of these disposal orbits are very short, then we end up with about 40-45 catastrophic collisions (over 200 years in the general satellite population)," he explained. "In the 'reference population' (ie without a mega constellation), we get 37-38 catastrophic collisions. So, you can see how we can bring things back in terms of the impacts on the environment. But even at 85% compliance with post-mission disposal, we almost double the number of catastrophic collisions, we double the number of objects we see in the environment." The Southampton study was funded by the European Space Agency (Esa) and is being presented this week at the 7th European Conference on Space Debris in Darmstadt, Germany. 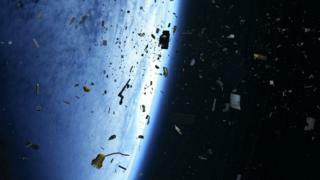 Dr Holger Krag, who heads the Space Debris Office at Esa, said the mega-constellation proposals now coming from satellite operators had to improve on the industry's past performance. "Spacefarers of today already fail to implement mitigation measures to a sufficient level," he told the conference. "My office regularly monitors space surveillance data in order to form statistics on how well we behave globally. One example is for post-mission disposal to remove spacecraft (from low-Earth orbit) in order to avoid long-term presence in space after the mission. Forty percent of all missions fail to implement this today." In 1978, Dr Don Kessler, then a US space agency (Nasa) scientist, postulated a scenario in which collisions could eventually lead to a cascade of debris that made certain orbits inoperable. At the Darmstadt conference, he reported on new research that revealed more than 10% of satellites in a sizeable sample had experienced sudden, unexpected momentum changes. These, Dr Kessler said, were likely caused by the impacts of small particles - of the kind that hit the solar array of Europe’s Sentinel-1A radar satellite last year.